We are the company we keep. For JustMe of the Scribbling Idiots, the proverb is simply confirmation of how the emcee/producer from Kentucky has come to be the well-respected veteran he is today. Jaime Tardy, author of The Eventual Millionaire and founder of eventualmillionaire.com, in a recent interview with EntrepreneurOnFire.com, suggested that one of the most important keys to success is a mentor. According to Jaime, this is how successful business people climb the financial ranks, and any hip hop head knows that this is a crucial element in the development of an authentic artist, a part of paying dues. JustMe was fortunate to have crossed paths with San Diego’s Future Shock as a young emcee, and credits that relationship as playing a pivotal role in how he has become who he is today, as an artist and a man. As JustMe continues to drop quality content, and as the Scribbling Idiots recently released Invitation Only, we see that JustMe is still surrounded by high quality, like-minded artists – Illect Recordings label mates and more. SOHH was able to catch up with an excited JustMe as anticipation of the release of Invitation Only grows. Sphere of Hip Hop readers are sure to have, at the very least, a cursory familiarity with JustMe; for those who might be less familiar with you, who is JustMe? 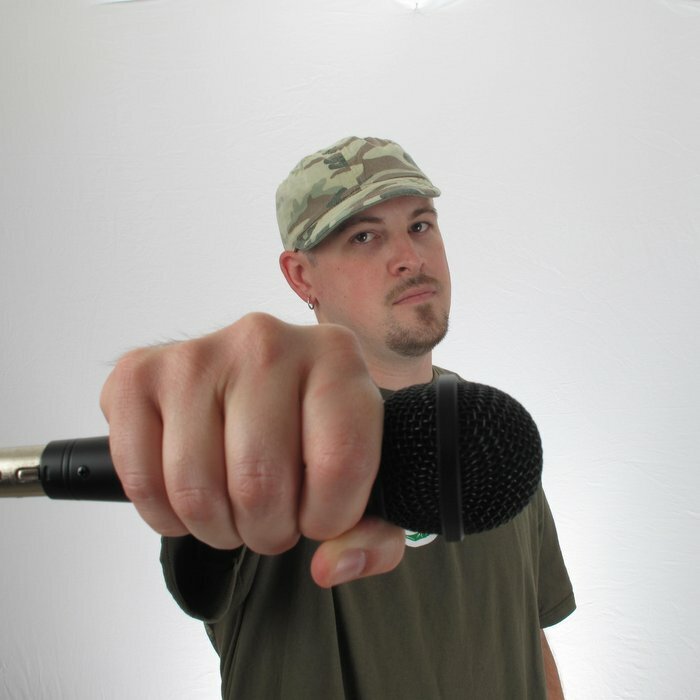 Emcee, producer, and all around hip-hop head. I’m a husband and a father, a martial artist, and an avid reader (especially on the subjects of history and theology). I’m a SolSeeker, a Scribbling Idiot, and a member of Tribe Called Lex, representing KY for over a decade now. What ONE record would you point a listener to, to represent JustMe most accurately? Why? That’s tough man! Every song you record is a piece of you. If it was one song, I’d probably say “The Prodigal” off the Tragedy & Dope album. That’s my autobiography. There are so many directions I would love to take this, but I will try to stay focused. Let’s have you share a little bit about how you became the JustMe here today. I was born and raised in Southern California. I’ve been [active in] hip-hop my whole life. I started DJing when I was 13, and started writing rhymes around the same time. The guys from Future Shock took me under their wing when I was 16. I paid my dues opening shows for Future Shock and Tunnel Rats, as a member of SolSeekers. In 2002 I moved to Kentucky. That’s when I met Deacon The Villain of CunninLynguists. The next year, we rolled up to Scribble Jam, and I met Cas Metah. Cas and I started Scribbling Idiots, but I’ve always continued to express myself as a solo artist as well. Who/what have been some of your influences? My dad has always had a huge music collection. I grew up hearing him play tons of classic rock, r&b, jazz, all that. As far as rap goes, my favorites growing up were Ice Cube and LL Cool J, but I soaked it all up man! Certainly, the guys from Future Shock were a huge influence on me. They taught me how to make a beat, how to craft a song, how to rock a show. More importantly, they taught me how to be a servant. Those are my big brothers for life! Three favorite emcees (not necessarily the three best) and why? Common – because he does such a great job of balancing heartfelt, soulful messages with ill lyricism. Ras Kass – because of the literary approach to his lyrics. Pharoahe Monch – because he can do it all. Styles, patterns, metaphors, similes, concepts, you name it. Three favorite producers and why? DJ Premier – because of the chop and the scratch hook. Piece of Strange (Deacon The Villain and Kno) – because their beats are luscious, fully formed works of art. Alchemist – because dude’s entire catalog is amazing! Well, like I said before, I started off DJing. So, I would throw on the instrumentals from a 12″ and record my raps that way. I didn’t start really “making music” until I met Sojourn my sophomore year of high school. He was already making demo tapes with Future Shock, and I was like “that’s how I wanna do it!” Sojourn had an 8 second sampler and a four track that he would bring over and we would make beats. That’s when I knew I was gonna go all out. Would you share both an event that encouraged you to keep going, and a moment that made you question whether you could keep pushing forward in music? About 5 years ago I released my second record Before The Twilight with Commissioner Gordon, and it really didn’t go anywhere. I thought it was a good record, and ComGo really did his thing on the beats, but anyway…I was done man. I was like “what’s the point?” Then two things happened that changed my mind. My boys Devine Carama and Sheisty Khrist were working on a mixtape, and they recorded it at my place. Sitting in the studio with those guys, just building and listening, it got my creative juices flowing again. I still didn’t know what I was gonna do though. Then one day Deacon calls me, and he’s like “I think we should do an album together”. There was no way I was passing up that opportunity. Now that we have some of your history, let’s focus in a bit more on your music. Why do you make music? For all the same reasons anyone makes art: because I love it, because it’s therapeutic, because somebody made the mistake of telling me I was good at it. Haha! What inspires such a heavy focus on social\political issues? Faith, love, hope. I’m outspoken about the things I believe in. It’s what I care about. Some artists care about getting rich, getting laid, or getting high. That ain’t me. I wanna make a difference in the world. You have/do put out a lot of music. How are you able to create so much content? Haha! Sometimes it doesn’t feel like enough. Inspiration is everywhere, and I’ve been blessed with opportunities to work with talented producers and emcees from around the world. They push me to keep creating! Not only do you create music as a solo artist, you are one of the most recognized members of the Scribbling Idiots. Can you summarize your relationship, from inception to the present, with the SI crew? When I met Cas Metah it was a symbiotic relationship. I’d help him record a good album, and he’d help me get some shows in Ohio. It went from that to doing a project together, to starting a group, to inviting all these other guys to join in. I was the seasoned vet in the crew. I’d toured and worked with labels. So, I’ve always been the elder so to speak. How much excitement and anticipation and energy has been poured into the Invitation Only project with SI? With The Guest Room album, Cas proved that he was good at putting a bunch of artists together. So, we asked him to start working on it. In his infinite wisdom, Cas put at least one member of SI on every song. Haha! So it became a Scribbling Idiots record. What has been one high moment in the creation of the project? For me it would have to be hearing the final product. This record took years to put together, and there have been a lot of obstacles along the way. Cas really deserves a ton of credit for staying on the grind and making a lot of these great collaborations happen. I heard “Pass It” after Sojourn posted it on FB – it definitely built my anticipation of the album. Share a little about that track. Sojourn produced that track. It’s a great posse cut combining members of Deepspace5, Tunnel Rats, and Scribbling Idiots. I’m just geeked that I finally got to be on a track with Jurny Big! Dude’s a legend, and even though we have known each other forever, that was a big deal to me. Are we going to be able to catch the crew rockin’ live together? When/where? I’m not sure. You guys have no idea how much we have in store for y’all in 2015! It’s never easy to get everybody together, but it’s not out of the question! JustMe, SOHH is honored to have you share your time and thoughts with us. Any thoughts to leave hip hop culture with as we wrap this up? Love your neighbor! You will see a lot more growth, progress, and success if you build each other up, than if you put each other down. Where can SOHH readers stay up on what JustMe is up to in the future? Justmeofsi on Facebook, Instagram, and Twitter. Shop for JustMe and Scribbling Idiots releases at SphereofhiphopStore.com.